WHAT IS A DEFORMITY AND WHAT IS NORMAL? Sometimes parents worry because they think a part of their child's body is abnormal or deformed. But in small children, often what seems unusual is within what is normal, and will get better as the child grows. For this reason, it is important to know what variations are normal and which may be problems. Note: For children born with parts of their bodies missing or shortened, see Chapter 12 on birth defects. 1. Many children are born with their feet somewhat bent or crooked. To learn the difference between a normal bend caused by the baby's position in the womb, and true club feet, see the next page. 3. A baby's legs often bend outward ('bow legs'), like this. This bending starts to disappear at the age of 18 months. Then the legs slowly straighten until they actually bend inward a little, like this. 4. This 'knock-kneed' position generally develops around age 2. By age 5 or 6 the knees begin to straighten. IMPORTANT: In any child who develops bow legs or knock-knees, check for signs of rickets and other problems. See Chapter 13. To check for severe knock-knees, have the child stand with her knees touching. If the distance between the ankle bones is more than 3 inches in a 3 year old, or 4 inches in a 4 year old, the problem is probably severe enough to need attention. If the knock-knees are severe, braces may help straighten the knees and keep the condition from getting worse (see Page 539). In a child over 6 or 7 years old, braces usually do not help. In extreme cases, surgery may be needed. Knock-knees may also lead to flat feet. About 3 out of 1,000 children are born with a club foot (or feet). Sometimes it runs in the family, but usually the cause is unknown. Sometimes a newborn baby's feet turn inward, just because they were in that position in the mother's womb. If the front part of a baby's foot is turned inward, it will often straighten out by itself before she is 2 years old. To find out whether the condition is likely to correct itself, or if it is a true deformity (club foot) that needs special attention, try to put the foot in a normal position. If you can easily straighten the foot, and bend it into a position opposite to the way it was turned, the foot probably does not have a bone deformity and will get better by itself. Also, if you scratch the foot lightly, the child often will move it into a normal position. If you cannot put the foot in a normal position, it will need to be straightened with strapping or casts (see Chapter 60). Are club feet a sign of some other problem? Although club foot often occurs without any other problem, occasionally it is a complication of spina bifida (problem in the spinal cord,see Chapter 22). Always check the child's spine and test if he has feeling in his feet (see Page 39). The feet may also gradually become deformed into a 'club foot' position, because of cerebral palsy, polio, arthritis, or spinal cord damage. Rarely, club feet occur together with a 'clubbed hand' or other weakness and deformities of the body. See Arthrogryposis, Page 122. About 60% of club feet can be effectively straightened without surgery in 6 to 8 weeks, using either strapping or casts. These methods are described in Chapter 60. 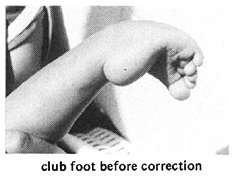 Correction of club feet should begin soon after the child is born-if possible, in the first 2 days. At birth, a baby's bones and joints are still soft. As the child gets older, his bones get harder and become less flexible. Usually, good correction without surgery is only possible in the first year of life. If the deformity is not severe, however, a club foot can sometimes be corrected with casts, even if the child is already 2, 3, or even 5 years old or more. But in an older child, it takes longer, and surgery is more often needed for good, lasting results. Some children with very deformed feet will need surgery, even if strapping or casting is done early. However, we have found that some children for whom surgeons have recommended surgery can have their feet straightened with casts at a village center. An ankle brace should be worn night and day at least until the child is walking, and often until the child is 15 or 18 years old. Foot-stretching exercises will be needed, especially if there is any sign that the foot is clubbing again. Gently and steadily stretch the foot past its normal position in the opposite direction of the deformity. Do this exercise 2 or more times a day. Check the foot regularly. Return quickly to the rehabilitation center for an evaluation if there is any sign that the clubbing is coming back. The severity of clubbing. A severely deformed foot with abnormal bones is much harder to correct. Generally, correction is more difficult if both feet are clubbed. Club feet in girls (although less common) are likely to be more difficult to correct than in boys. If there are any other abnormalities (such as a clubbed hand or stiffness in the knees or elbows), club feet may be especially difficult to correct. Usually surgery is needed. The older the child, the harder it is to correct a club foot. Past the age of 2 years, it is often not possible without surgery. Children without feeling in their feet (spina bifida) require special precautions and slower correction to avoid pressure sores (see Page 173). Casts, if used, must not apply much pressure, and must be changed often. If a child's foot shows little or no improvement after 4 weeks of casting, or if improvement stops in spite of continued casting, surgery is probably needed for more complete correction. For some feet, a plastic ankle brace may work well. For more difficult feet, a metal brace may be needed, with an ankle strap that pulls the ankle inward. A slight build-up on the outer edge of the sandal or shoe may also help. For instructions on making braces, see Chapter 58. For babies under one year, or small children at night, feet can be held in a good position using a bar that joins the 2 feet. For a simple design, see Page 539.
wearing shoes in reverse may help keep the feet corrected. Most children whose only problem is flat feet really have no problem at all-except that poorly informed doctors or greedy special-shoe salesmen make their parents think so! Most babies have naturally fat feet, which can look flat. Do not confuse a FAT foot with a FLAT foot! In older children and adults there is a lot of natural variation in people's arches. Even a foot as flat as this, if it causes the child no pain, need not be considered a problem. Often flat feet run in families. If parents or relatives have similar feet but no pain, or if the child can move his feet strongly in all directions, do not worry about it. Do not worry about flat feet if there is no pain, obvious weakness, or loss of movement. Children who are late beginning to walk often have weak arches with flat feet, until their feet get stronger. Even children with very flat feet seldom develop a problem or have more than average pain or discomfort when they do a lot of standing or walking. Usually flat feet are a problem only when paralysis or brain damage is the cause-as in some children with polio, cerebral palsy, or spina bifida. Also, children with Down syndrome sometimes have flat feet that may lead to pain or discomfort. The best treatment to help the child with flat feet and no other problem may be to go barefoot. Walking barefoot on sand or rough ground helps the feet get stronger and form a natural arch. Walking on tiptoe, skipping rope, and picking things up with the toes may also help. BEWARE of going barefoot where hookworm is common. CAUTION: Special exercises, training in 'foot posture', shoe adaptations, heel wedges and shoe inserts (heel cups and insoles) are often prescribed to correct flat feet. However, studies show that usually none of these help. Use of insoles to support the arches may even cause weaker arches. Usually insoles should be tried only when pain is a problem, or in some severe flat feet caused by polio, cerebral palsy, or Down syndrome. Some children with flat feet resulting from polio, cerebral palsy, or Down syndrome may be helped by insoles or other foot supports. But other children will not be helped. Each child's needs should be carefully considered. If after trying an insole for 2 weeks, the child walks with more difficulty, change the insole or stop using it. Before making the final insole, put a piece of cardboard, wood or some other material shaped like the insole, under the child's foot. Try different heights to find what seems to work best. Make sure the heel is in a straight line with the leg. After making the insole, check the position of the foot. Do this with the child standing on just the insole, and then with the insole inside the shoe. Watch him walk, and ask him how it feels. If everything seems right, check it again in 2 weeks. CAUTION: A person who has a weak ankle and low arch sometimes cannot use an insole, because it lets his ankle turn outward as he walks. He may have learned to walk in a way that keeps his ankle from turning out. For such a person, an insole may make walking more difficult, or may force him to use a brace to keep his foot straight. IMPORTANT: The thickest part of an insole should be directly under the ankle bone, just in front of the heel, like this. It should not be in the middle of the arch, like this. This can deform the foot more without correcting the problem. WARNING: Many commercial insoles, and even orthopedic shoes, have the arches in this incorrect position. Check them carefully. If they are like this, do not use them. Also be sure shoes are not so wide that the heel slips to the side. If the child's foot is flat or very floppy due to paralysis, often an insole is not enough. He may need short plastic brace that supports the foot like this. or a brace that supports the foot and ankle, like this. For instructions on making plastic braces, see Chapter 58. There is probably only one shoe or sandal alteration that does any good. A small metal plate on the inner edge of the heel stops uneven wear-and may help prevent foot pain.